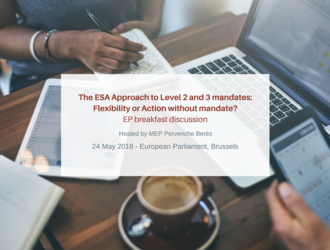 On the 24th of May (8h00 -9h15) the EACB, with the support of Ms Berès, will organize a political breakfast at the European Parliament. The ESA review provides the opportunity to assess the practice of the European Supervisory Authorities regarding level 2 (technical standards) and 3 (guidelines) measures. During the past years, the EBA, EIOPA and ESMA have certainly prepared or adopted several hundreds of such measures. The high technical quality of these measures is undisputed and there is no doubt that they have contributed very much to the high quality of the regulatory framework for banks in the EU. However, some of these measures were criticised as going beyond the mandate or considerably re-calibrating the aim of the text decided by the legislator. Several publications have addressed these cases, but seemingly did not lead to a fundamental discussion of the matter. A recent example are the EBA/ESMA joint Guidelines (GLs) to assess the suitability of members of management bodies and key function holders and the EBA GLs on Internal Governance, which were both published in September 2016 and will apply as of 30 June 2018. While the objective of these Guidelines to enhance the governance of banks in the EU is widely supported, there is concern that the implementation of certain aspects of the GLs would still be incompatible with organizational structures of cooperative banks in some countries. In particular, the rigid approach to the requirement of formal independence of board members is very intrusive. In some Member States it threatens the cooperative banks’ particularities in terms of governance model and member involvement. The fact that the CRD does not mention the concept of formal independence nor impose any requirements in this respect also provides food for the discussion on the mandates of the ESAs and their limits. This example raises the question about the amount of flexibility that should be given to the European Supervisory Authorities in the field of regulatory activities and what should be off-limits in order to protect the rights of citizens. The ESAs should reflect on these experiences and seek improvement.